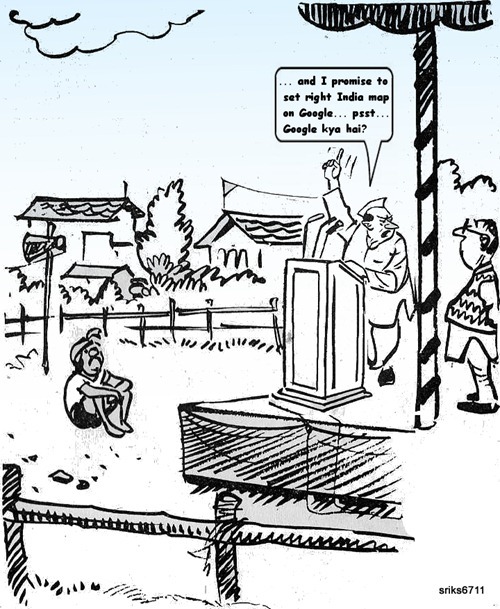 A typical Indian Babu and his promises..
Author’s Disclaimer: The above cartoon is a mesh of 2 cartoons by Laxman. I could have drawn it myself but as a blue-blood software engineer by training, re-use is the mantra here. Hope ToI does not mind and am sure Laxman himself supports a liberal CC license. With that out of the way, everything that has India in the headline and a foreign agent sullying the name or borders of this great country is what feeds our fat netas. I will be surprised if such a speech as depicted is not being made in some panchayat elections as we speak to ignorant babus and clueless villagers. Srikant Jakilinki is just another human being floating away in space on a big blue marble revolving around a rather unspectacular yellow star. He works , blogs and draws. After Google Wave, the end of Orkut is nigh?